Dancing With the Stars: Athletes: Who Made the Final 3? Three weeks in and only three contestants to go! We will not lie, this shortened season of DWTS is weirding us out. No one is getting real critiques. No one has had time to improve. Few have had time to make us care. Everything feels like it's on fast-forward! It's just a strange Dancing with the Stars experience. That said, we're not that shocked by the final three. 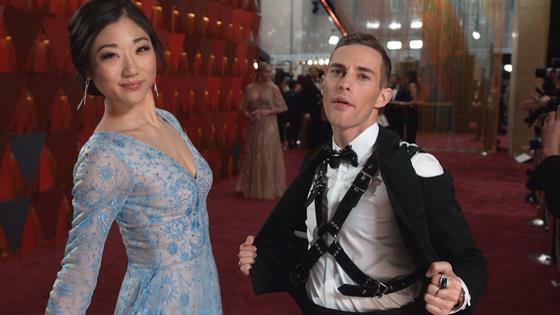 We did imagine Mirai Nagasu would be there in a trio of Olympic skaters, but she actually lost out to Josh Norman, who joins Adam Rippon and Tonya Harding in next week's finale. Tonya earned a 33/40 this week for her emotional dance for her dad, Josh earned four nines for his contemporary, and Adam very nearly had a perfect score if it weren't for Len giving him a nine. Dang it Len! Regardless, Adam and Jenna were the top scorers of the night, and even won their showdown against Mirai and Alan. Adam and Jenna have really been the top scorers (both in our hearts and on the leaderboard) this whole weird season so far, so if they don't win, it will be a bummer. But again, we're still feeling like Adam and Jenna's partnership was wasted on this mini season, so perhaps it's about time for an all stars season, hmm?